In this article I want to take a look at how air cargo was handled by American Airlines in 1955. At this time there was three different types of cargo traffic they are grouped under the title air cargo. Air freight, differs from (2) and (3) in that the airline is the carrier and most of the time the selling agent also freight space is sold in the same way as passenger space though the load is handled and stowed in a different way and is carried for a lower fare. contract between the public and the airlines in the case of air mail, which is a service offered by the Post Office for the high-speed delivery of cards, letters, printed matter and parcels. There seems no reason why the bulk of express and mail traffic should not always be carried as supplementary loads on passenger aircraft. By contrast, the all-freight service is aviation's equivalent to the goods train or cargo ship, carrying bulky loads at relatively low rates. scheduled services of B.EA. and all British independent operators during the same period. American Airlines inaugurated all-freight services, with converted DC-3s, in October 1944. 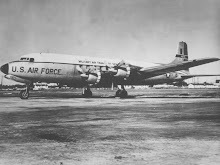 DC-4 freighters were introduced in June 1946 and DC-6A Liftmasters—the first aircraft built specifically for long-range cargo work—came into service in May 1953. 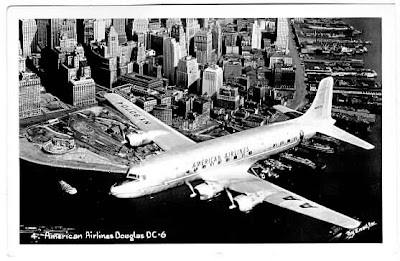 Since the introduction of those DC-3 services A.A's freight traffic has grown enormously—from 2m ton-miles in 1944-45 to over 30 times that total last year. It is important to note that these figures include the freight carried on passenger services and that the working capacity provided by the all-freight division is still supplementary to that of the main fleet. The nine DC-4s and four DC-6As are today carrying about 35 per cent of AA's total freight and express traffic. They are operated over a carefully planned network embracing one-fifth of the 77 cities served by American Airlines—including, of course, such major traffic centres as New York, Buffalo, Detroit,Chicago and Los Angeles. 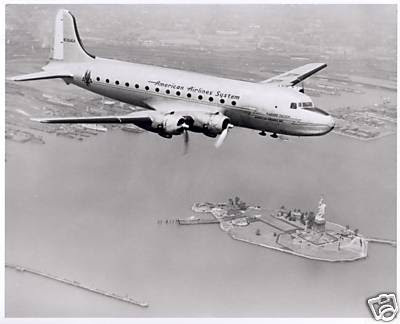 The backbone of the all-freight network is the trans-continental route between New York and Los Angeles, which is flown nightly by DC-6As to give next-day delivery to consignees on either side of the continent. Calls are made at Detroit and Chicago in each direction. passenger, 54 cents; mail, 39 cents; express, 37 cents; freight, less than 22 cents. This figure of 22 cents per ton-mile is the average yield, though individual rates vary (according to distance, direction and type of load) over a range of approximately 16 to 24 cents. In exceptional cases air freight is carried for as little as 12 cents per ton-mile. To put these costs into some kind of perspective it may be added that road-transport charges for the class of goods carried by air are in the region of 6 to 7 cents per ton-mile, and that equivalent rail rates are perhaps 3 to 5 cents. The earnings of transatlantic carriers are now standing at about 40 to 44 cents per ton-mile of air freight. Air freight is still in an early stage of development on the relatively short and low density air routes of Europe, and this is naturally reflected in high rates and a low volume of traffic. sending the same shipment by air from London to Rome, even though the distances involved are, respectively, 2,500 and 900 miles. The problems faced by the operator—and his solutions to them are reflected in the pages of the air-freight tariff. A fundamental difficulty is that most freight travels only once; return loads are not guaranteed. The rate charged must, therefore, be reduced when necessary to attract some kind of load aboard an aircraft which would otherwise return to its base empty after outward trip. Thus, 50-odd commodity groups are listed in the American Airlines freight tariff, and it will be seen, for example, that fruit and flowers from the West Coast can be shipped to New York at a more favourable rate than clothing or electrical parts moving from the industrial east to the agricultural west. A second reason for the commodity-rate system is, of course, that reduction of a cent or two may turn the scales in the airline's favour when competing with a surface carrier for a large contract. Handling costs vary according to the size of load carried, and the tariff system covers this problem by the incorporation of "break-points," which define the minimum weights at which various bulk discounts apply. Break-points vary with the type of commodity and the route. Normally, however, the first discount is offered for loads of about 50 lb and in some cases there are further break-points at 1,000, 2,000, 3,000, 5,000 and 10,000 lb. The economy of American air freight is thus largely based on the carriage of items weighing at least 50 lb and consignments below this weight can generally be considered as being more suitable for shipment via the air express service. At this stage the freight forwarder makes his appearance. and pays himself with the balance. In New York, Los Angeles and Chicago, forwarders feed in a sizeable proportion of the freight flown out of these cities by American Airlines—probably 25 or 30 per cent in the case ofNew York.Contrary perhaps to general belief, most air-freight revenuecomes from consignees rather than consignors. Something like90 per cent of American's freight traffic is routed by consignees. Unlike air express, air freight is essentially an airport-to-airport service. Rates are based on the cost of carriage between airports, though for an additional charge truck delivery is available to and from any airport; the airline does not itself maintain vehicles for this purpose and allocates the work to local transport services. The question "What sort of goods are moved by air freight?" is answered by the list overleaf. It separates into 20 categories the total freight uplifted by American Airlines during one month of 1954. The diversity of the list is its most impressive feature, indicating that air freight is being appreciated and used in a wide cross-section of American industry and agriculture. users of surface transport would consider the change to air freight. In the first case, when freight rates are the only variable, the decision will be made on a straightforward comparison of charges. accordingly. The beginnings of this trend can already be detected in America,where quality of air service is beginning to be taken as a major factor in the choice of location for new towns and factories. People first, bottom up is a reality today, with the generation of grass root bloggers and you tubers.